The government of Pakistan had declared, under its national emergency plan, earlier this year to eradicate polio before 2012. Unfortunately, however, the country seems set to miss this deadline as the number of polio cases in Pakistan soars to 132 so far with two months still to go before the year ends. Adding to the nation's faltering struggle against this menace, a leaked report prepared by the Prime Minister's Inspection Commission (PMIC) shockingly reveals that polio vaccines funded by a Swiss NGO are allegedly causing deaths and disabilities in children. This government report reveals information, which should be a source of tremendous concern for the government and parents alike. Far removed from the hope to eradicate polio within this year, the country now hosts more cases of polio than all other three countries, which are still afflicted by this menace - India, Afghanistan and Nigeria - combined. Following China's confirmation that the disease had crossed Pakistani border into China, resulting in crippling four children, India jumped to pre-emptive safety precautions and announced setting up of screening booths at all entry points along the India-Pakistan border to administer polio drops to children five years or younger. 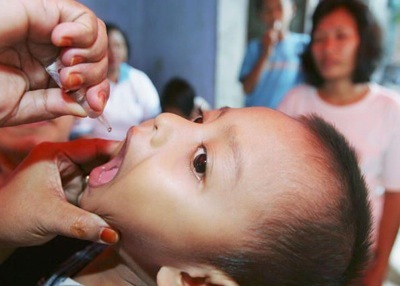 Running a successful polio campaign in the country is an uphill task. The factors contributing for the failure to control it are numerous. Porous borders between Afghanistan and Pakistan mean each country repeatedly infects the other. Major pockets or polio cases are clustered in Quetta, Fata region and Karachi. The security situation and repeated floods have made access to remote areas of the country quite difficult. The draft National Emergency Action Plan, 2011 for polio eradication admitted that 10 to 20 percent of children are not given their third dose of polio vaccination. Added to this, the apocalyptic warnings by some in the clergy and the militants in the north related to "western conspiracies" to sterilise Muslim children through polio drops has also created a sense of paranoia among the traditionally conservative families. The fact that the American intelligence agencies employed a local doctor to spy on Osama bin Laden's house under the garb of administering polio drops has also not helped the matter one bit. In light of these staggering odds, the fact that a supposedly reputed NGO, which funds 7.8 percent of the five-year budget of Pakistan's Expanded Programme on Immunisation (EPI), has been the source of potentially fatal and crippling vaccine should ring alarm bells in every corridor of power. GAVI is supposedly an organisation of repute which boasts partners such as the Bill and Melinda Gates Children's Vaccine Programme, Rockefeller Foundation, Unicef, WHO and the World Bank. This fact alone is enough to cause doubts over the integrity of other international organisations which associate with GAVI. The Prime Minister needs to take up this report with utmost urgency. He must direct the government to raise its voice at the UN level, and demand explanation why the UN agencies are partnering with an organisation which allegedly endangers the lives of millions of poor children. More importantly, the government needs to hold a proper investigation to find out how the agreement with GAVI was reached before verifying the quality of the vaccines, which according to the report, are also very expensive. The claims made in the report that these vaccines are not even tested in laboratory after procurement to ensure their quality, also need to be re-evaluated. It is a sad state of affairs that this report was submitted to the Prime Minister's office in June and yet no investigation has been ordered, nor any drive been suspended amidst rising fear of its safety. The recommendations given by PMIC need to be implemented in their letter and in spirit. The situation should serve as a wake-up call to our health authorities. The same "people" pushing vaccines are the same "people" calling for massive population reduction and it's just remarkable that so many can't put 1 and 1 together and come up with WTF! Any trolls that are paid to post comments need not respond to my post because I'm well aware of how the world really works, so bugger off. The fact that some of the vaccines are 'poison,' in that they aren't properly tested, serves as another example of a failed system and provides the core reasoning as to why people don't get their children vaccinated. Sad indeed. This page contains a single entry by sal published on November 21, 2011 3:58 PM. Smoke, Mirrors, and the “Disappearance” Of Polio was the previous entry in this blog. Like Candy? Foster Kids Get More Antipsychotics is the next entry in this blog.